For the last few years I've made new year resolutions, it's what got me into photography as a serious hobby, so I've been thinking a lot about what I would set myself this year. My black and white work is going to be shot on one camera, one lens, and one film. For this I'll be using the Pentax SP500, Asahi Takumar 50mm f1.4, and Ilford Delta 100. I want to learn a lot about black and white photography and to do that it needs to have a constant. The developing of this film will be done in Ilford Perceptol throughout too. I'm going to spend more time in the darkroom making prints, even if this is only once a month. I love the manual process of film photography and yet the convenience of a film scanner makes it too easy to rely on that alone. Fun...I want to have more fun with my photography. 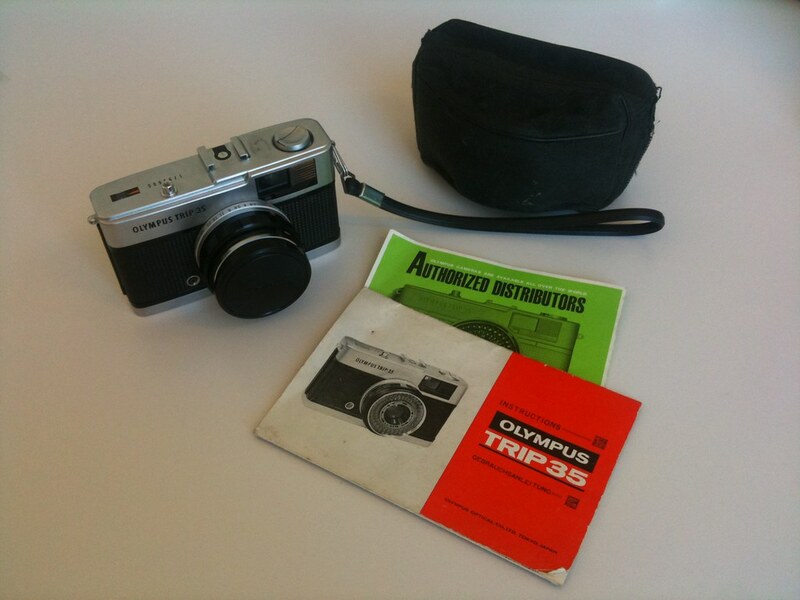 I now have an Olympus Trip 35, a Holga 120N, 120 wide pinhole, and a Polaroid Land Camera Automatic 100 and want to mess around with different films and processes with these to see what I can get out of them. I'm quite excited to start to the year ahead now. It's going to be interesting to see what I have learned by this time next year. What are your plans in photography for 2012? It's been far too long since I stocked up on film properly, the last time was for our trip to Edinburgh Airport last Christmas. I say Edinburgh Airport because our flight to Paris was cancelled due to snow and we took the saddest bus trip back to the house (we made it in April finally). Since then I've only bought a handful of rolls at a time. With Christmas offers floating around I decided to take advantage of a few starting with Lomography. Lomography were responsible for the batch of Ilford Delta 100 above with their Christmas offer of 23% off and free delivery on spends over £25. The thing with Lomography is that the more you spend, the more you save so I bought 5 x 35mm and 5 x 120mm. If I'm honest, I've never been a fan of the Lomography brand but this has opened my eyes to them quite a bit - there is no denying their support for film photography. I also bought 5 x Kodak Portra 400 from a regular supplier on eBay. This wasn't an offer but the spending bug had caught on and it seems a good opportunity to try out this legendary film to capture those indoor, around the table moments with the Trip 35 in it's first social occasion with decent film - I can't wait to use it. I would have liked to pick up some pack film for the Polaroid but I'm going to leave that until the new year now and when I get the bellows sorted out - they have a gapping hole in the bottom where the join on the bellows has dried out. 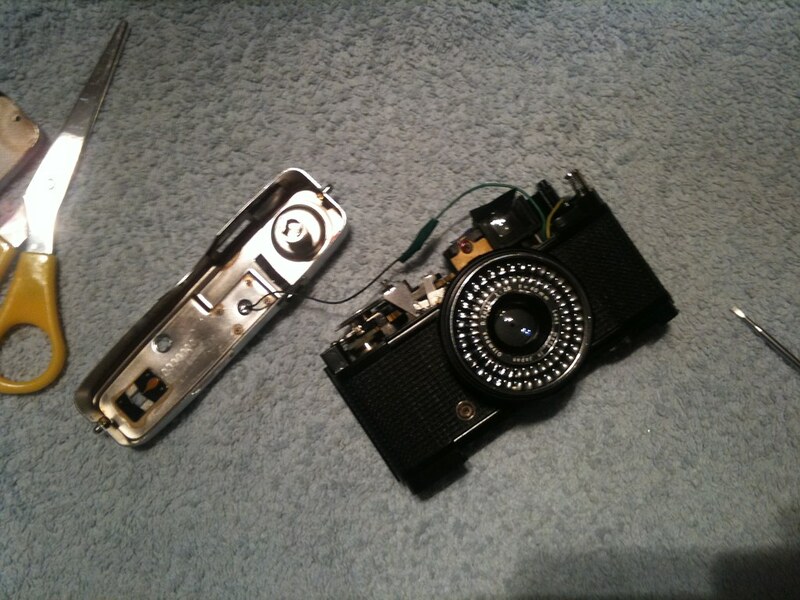 Holgarama posted a tweet asking if anyone needed parts for their Holga, they were cleaning out their parts bin so I managed to get a shutter release kit and wide angle lens for £12. I can't wait to get the Holga going again though it is unlikely to be over the festivities. So that is what I'm shooting, what are you shooting over the festivities? I hope everyone has a very merry Christmas! 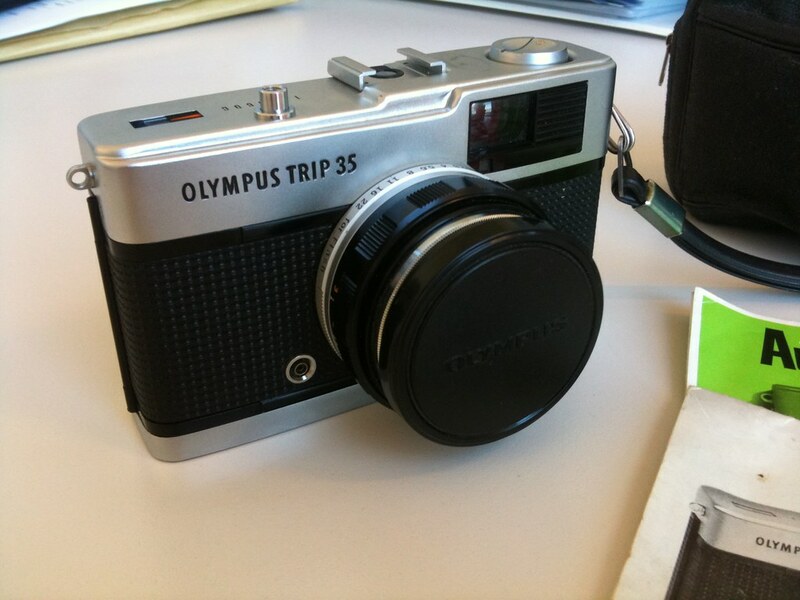 A few months ago I met my good friend Kerr for dinner where he brought along his newly purchased Olympus Trip 35. I just love how clever it was given it's simplicity, but also how solid it was for a point and shoot...it made a real impression with me. On my summer holiday I was thinking more and more about how useful it would be to enjoy film photography but in a more relaxed format. I shot both colour and black and white film on our trip and I had tried to shoot the colour film on days where we would chill out and enjoy each others company, and keep the black and white to the war memorials we were seeing in the area. This tied my camera up quite badly; I didn't need an SLR for the colour shots I was after and would find myself in situations where black and white would have been better suited but had colour film loaded and visa versa. I would end up rushing film to get onto the next roll. As my birthday approached last month I decided I was going to treat myself to two new cameras that I had my eye on for a while and the Olympus Trip 35 was one of them. eBay had a large selection available but one ended in a couple of days and was very low in price. The description read well, "like new" and "good working order", it had the lens cap still, case and the manuals. I decided my price and bid for it at the last second. I won. The pictures didn't lie; this camera looked great and has very few marks on the shell. It was built-in October 1974 according to the code printed on the press plate in the film door. A quick run through the operations showed it worked well...bar one important feature...the red flag. With this camera the auto exposure is it's sweet-spot; with no batteries needed, the selenium cell on the front will adjust the aperture and limited shutter speeds to give you a good exposure. In low light the button will lock and a red flag appear in the viewfinder. This camera was allowing me to take shots in all conditions and not trustworthy in auto exposure mode. 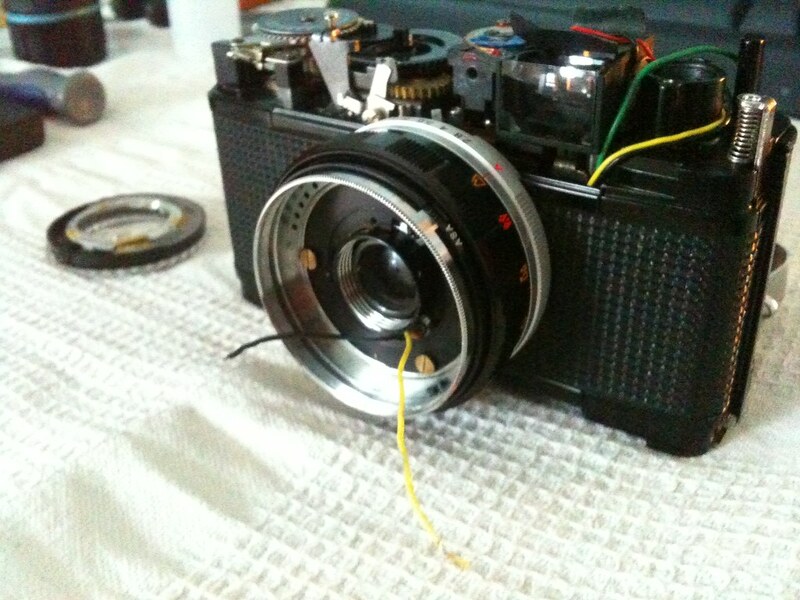 Secondly, the owner had added a UV filter at some point and this could not be easily removed due to cross-threading. I was gutted. 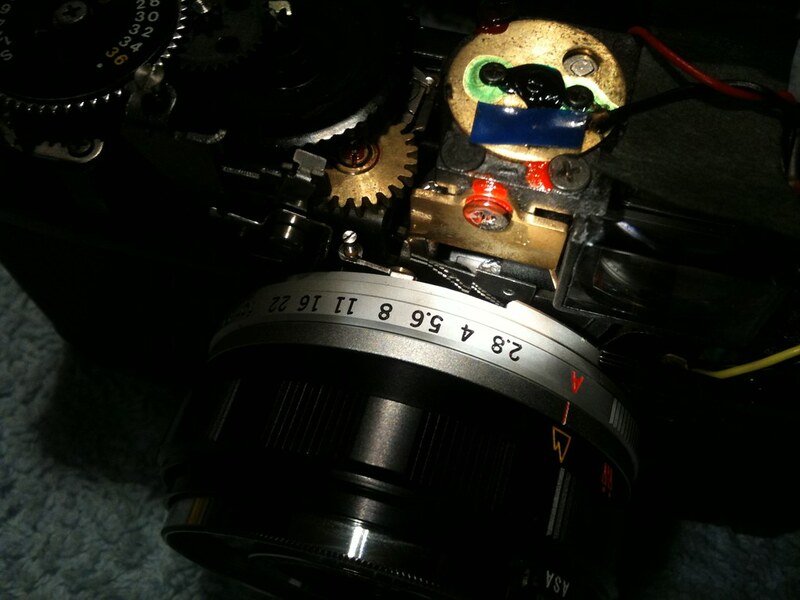 A look online provided a wealth of information with a guide on how to dismantle the camera to test different areas that may be causing the problem. With nothing to lose I opened the top of the camera and tested the meter by shining a light onto the selenium meter and watching for the internal needle to react. Nothing. Next I was onto the aperture blades and this involved carefully breaking down the lens to get to the blades and then cleaning them. 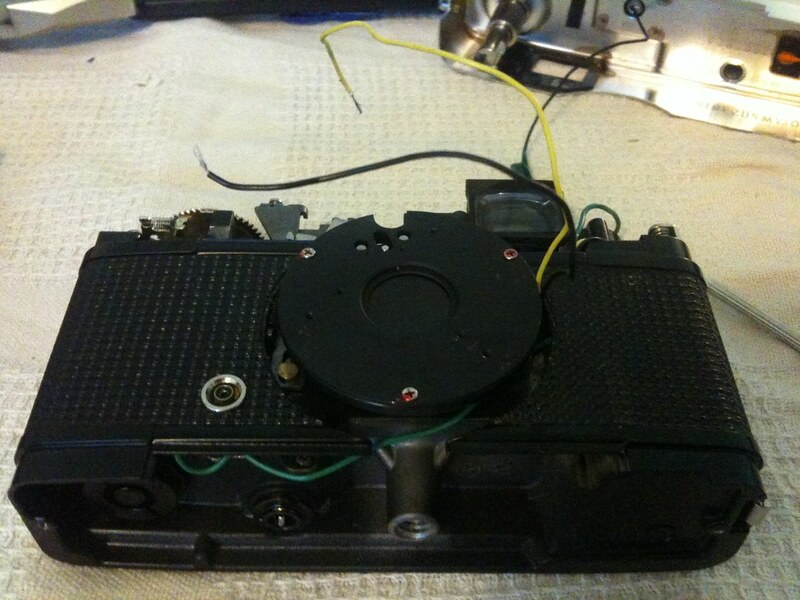 Two or three steps in and I was faced with removing the photocell on the front of the camera and it soon became clean what was wrong as it came away disconnected from the wires feeding the meter. This was going to need soldered and I didn't have the tools do that so I was onto Amazon and ordered one. I carried on down the lens until the I got the aperture blades and cleaned them up with lighter fluid. The lighter fluid worked a treat and, although the blades were not sticking badly, they completely freed up. I also applied this to the red flag mechanism as it was clear that this was having its own problems outside of the lack of metering, it worked though will need a lubricant to help it more. The soldering iron eventually arrived and I started to solder the ends back onto the photocell. The meter jumped into life but sadly my skill in soldering - non-existent - let me down badly and I'm unsure I've now caused more damage than good. 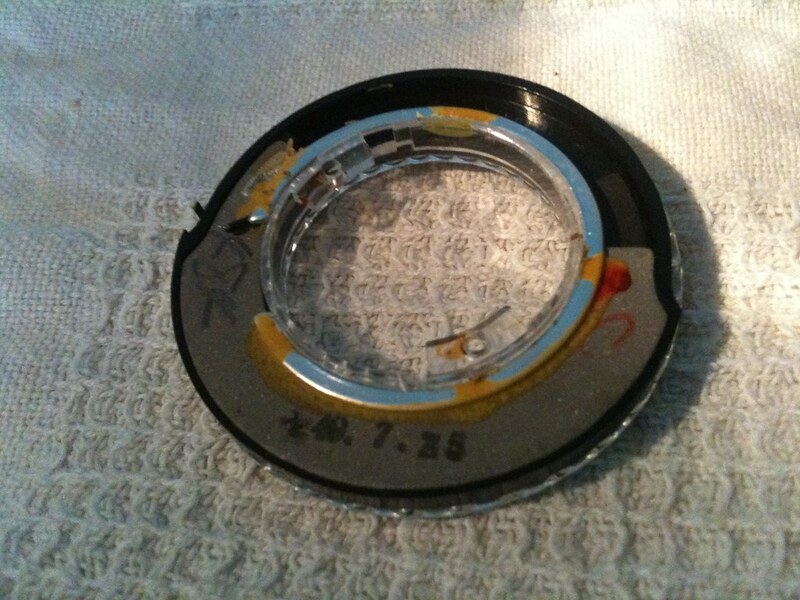 Soldering a side, the filter attached to the film speed ring was also removed earlier. I didn't want to damage the camera and was willing to sacrifice a UV filter to get it off. Sacrifice I did. With pliers and screwdrivers I destroyed the filter being careful to keep the damage I was inflicting to the filter and also little pressure on the camera as I did it. It wasn't for the faint of heart. Eventually the glass fell out the ring and with a pair of pliers I twisted the metal away from the camera and lifted it off. The fact the soldering worked briefly is both annoying and good news. It's annoying because now it is my own skill letting me down, and good because there is little wrong with the camera. My eBay watch list is still full of Trip35 auctions and it may get to the point where I cut my losses but I'm never one to give up so easily. As long as it is costing me very little then I'm happy tinkering...and there isn't much I don't know about how these cameras work now.